What did you want to be when you grew up? No, really. Think back. Remember what you wanted to spend your life doing? Picture yourself as a child, dreaming of the future, knowing someday you would be doing something you would be happy with every day. Do you remember that feeling? Is it a distant memory, or is it a part of your reality? Somewhere between childhood and becoming an adult, we are suddenly burdened with responsibility and this notion that supporting yourself and living your dream are irreconcilable. But why? Why does it have to be that way? I don’t think it has to! 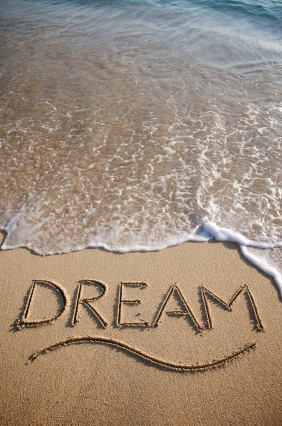 Here are a few thoughts on how to live your dream. Get paid for it. The obvious one would be just go out there and make it a career. Yes, it will take hard work, but you won’t notice it because you will be enjoying it. It also may not happen instantaneously, but be creative. How can you connect what you are doing now, or what you are experienced in, to your dream? Think of it as you being on one side of a river and your dream on the other, and now you have to build a bridge to live your dream. Make a plan, understand what steps will get you from where you are to where you want to go, and start implementing them! You will feel immensely more energized! Understand the root of your dream. Sometimes we have a dream that can be lived out in other ways. I wanted to be an actress when I grew up. What do actresses do? They perform in front of people, and they are at the center of attention (I can’t believe I’m admitting I like this). I found public speaking offers the same rewarding feeling. Can your dream be lived out in a way you haven’t thought about before? Volunteer. People frequently ask me what I do for fun. I feel lame saying that I am on the board of directors for a project management organization (I love projects and managing them!). That doesn’t sound like fun to most people, but it’s fun for me! Perhaps you don’t want to take the risk of trying to make money off your dream, or perhaps your dream seems too out of reach. Is there a way to live your dream on the side? If you enjoy art, can you teach it? Perhaps you can volunteer at an organization that needs marketing materials designed. There are many organizations that are looking for all sorts of talented people. Just find one you believe in, and start volunteering! Too many dreams are set aside and never lived. We need to reject that mentality and realize these dreams are a part of who we are, so if we really want to live to our fullest potential, we need to live our dreams! Let’s start a live-your-dream movement! ← I Don’t Want My Talent!